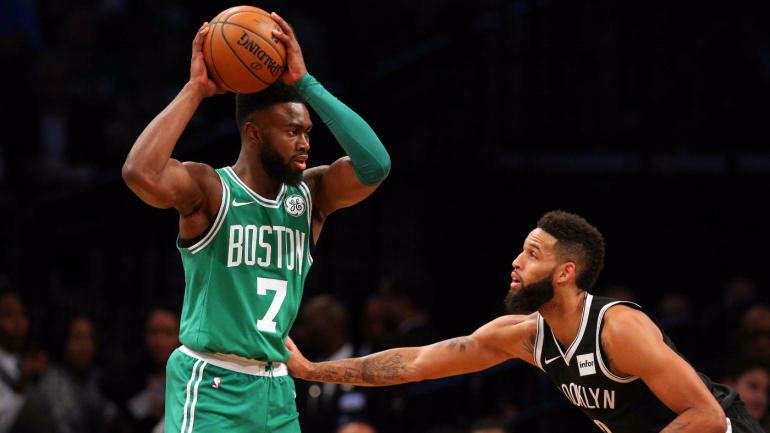 The Boston Celtics and Indiana Pacers have used a balanced offense coupled with a sterling defense to reach the 2019 NBA Playoffs. Now, the Eastern Conference rivals meet in the first round, with Game 1 taking place Sunday at TD Garden at 1 p.m. ET. The Celtics (49-33) overcame a late four-game losing streak to win six of eight down the stretch and secure home-court advantage in the first round of the NBA Playoffs 2019 as the No. 4 seed. This included two wins over the fifth-seeded Pacers (48-34), who used the NBA’s top scoring defense (104.7 points per game) to help overcome the loss of star Victor Oladipo to a season-ending knee injury. Boston is a seven-point favorite and the over-under for total points scored is 209.5 in the latest Celtics vs. Pacers odds. Before you make any Pacers vs. Celtics picks, listen to what the SportsLine Projection Model has to say. Now, the model has dialed in on Celtics vs. Pacers. We can tell you it is leaning under and it’s also generated an against the spread pick that hits well over 50 percent of the time. That one is available only at SportsLine. The model knows that part of Boston’s recent resurgence can be credited to a growing contribution by Gordon Hayward, who has shown signs of returning to All-Star form after missing last year with a fractured tibia. He averaged 14.7 points on 60 percent shooting in Boston’s last 14 regular-season games. He also came up big with 21 points while hitting all nine of his shots in a win over Indiana. Although the Celtics avoided serious injuries most of the season, they now have to deal with the absence of their top defender, Marcus Smart. He is out for at least two rounds of the NBA Playoffs 2019 with an oblique injury. Smart played in 80 games and started 60. His place in the starting lineup likely will be filled by Jaylen Brown, who averaged 13.0 points and 4.2 rebounds in 26 minutes. However, Boston’s recent dominance doesn’t mean it’s assured of covering the Celtics vs. Pacers spread in the NBA Playoffs on Sunday. Last year, the Pacers pushed LeBron James and the Cavaliers to seven games before eventually coming up short in a series they controlled much of the way. This year, they have managed to remain a viable contender despite playing more than half the season without their best player. They survived by playing stellar defense and sporting an unselfish offense that has six players averaging in double-figures, led by Bojan Bogdanovic at 18.0 points per game. After losing Oladipo, the Pacers allowed 108 points per 100 possessions, ranking No. 8 in the NBA. Who wins Pacers vs. Celtics? And which side of the spread hits in well over 50 percent of simulations? Visit SportsLine now to find out which side of the Pacers vs. Celtics spread you should be all over Sunday, all from the model that’s up more than $4,000 on top-rated NBA picks this season.